Each of the eight guest rooms has a private, full bathroom. Some of the guest rooms have individual balconies as well. 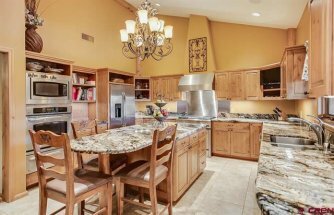 Commercial kitchen with everything you need to create gourmet meals for large groups: Imperial oven/range, deep fryer, Everest commercial refrigerator/freezer, dual deep sinks with sprayer, commercial dishwasher, huge pantry, ample counter space, and dishes/flatware/glassware for 60. Game room featuring a pool table, a full-size Texas Hold 'Em game table, built-in entertainment center, a wine cellar, and access to the hot tub deck and horseshoe pit. 1,600 Sq. Ft. heated garage and workshop with sound system, flat screen TV and utility sink. 3 additional covered carport spaces are found next to the garage. The 2nd level features three guest rooms with individual balconies, a wood burning fireplace with three comfortable sitting areas, ranging from intimate to large and open. 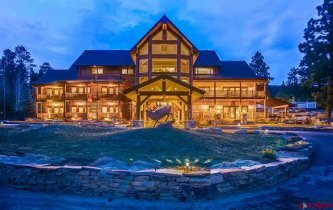 The main level encompasses a custom hand-crafted wet bar, a pass-thru wood burning fireplace with custom cedar mantle, three guest rooms with private decks, and an immense game room. 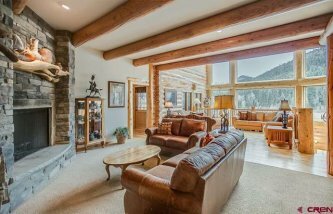 Contact Jeremiah Aukerman today 970.769.2407 to schedule a tour of this magnificent property, one of the top homes in the entire Durango area.